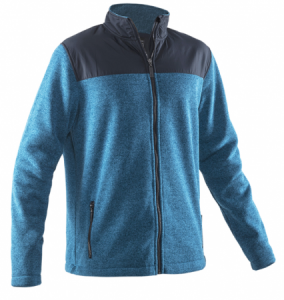 A warm and stretchable knitted fleece. With stretch lining in wind stop qualities. Woven contrast fa bric along inside sleeve and body side and woven wind flap and collar with two silver press buttons and also on cuffs. Two front pockets and adjustable drawstring at body bottom. Silver look zip.